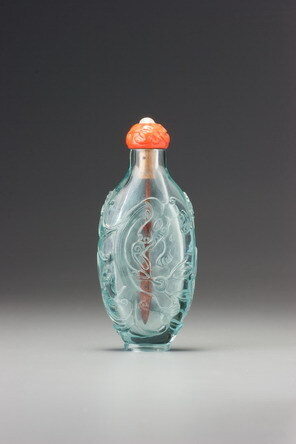 The design here is achieved by soldering wires to the flat copper surface of the bottle and filling between them; the only differences between this and a standard cloisonné bottle are that it is only partially filled and the copper that remains uncovered by enamels has been gilded. 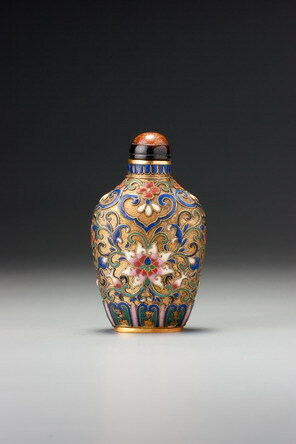 This partial cloisonné technique seems almost exclusively confined to snuff bottles produced for the court, and mostly probably to those from the palace workshops of the mid- to late Qianlong era. It appears on this and Sale 4, lot 124, both extremely rare variations. With its very Imperial subject, superb technical control, and lovely design, this is one of the most spectacular of all Imperial cloisonné bottles. It is remarkable for its carefully ‘drawn’ wires and the lovely ‘shading’ of the enamels in the lotus flowers (achieved by using three distinctly different colours). Its surface has not been polished flat in the usual way, leaving the enamel filling in the cloisons slightly convex. This is both rare and effective. For a detailed account of the process of manufacture based on both a nineteenth-century account and Hugh Moss’s 1974 observations, see the commentary on this bottle in Treasury 6.